Re-posted, with permission, and thanks, from this Feb 2 post by activist and writer Barbara H. Peterson at Farm Wars. Posted in interests of uncovering more of the story on the ground in Western states regarding the BLM, land grabs, Agenda 21, mining rights, oil and gas leases, and other such behind the LeVoy Finicum, Bundy, Hammond, and Malheur Refuge stories currently in the news. Also see other Agenda 21 articles here. From Farm Wars: “Barbara lives on a small ranch in Oregon where she raises geese, chickens, goats and horses. This rural lifestyle is under attack at the most basic level. Federal regulations and the corporate takeover of our food supply with Monsanto’s invasive GMO technology is designed to make it next to impossible to raise animals and organic food. Recent events in Burns, Oregon have shed light on just who is “grabbing the land.” Government operatives in the midst of the Malheur Wilderness turmoil have planted a false narrative that the BLM is simply trying to protect public lands from ranchers such as the Hammonds, who are trying to grab it for themselves, and supposed “environmentalists” are stepping up to support this propaganda. Congressman Rob Bishop (UT-01), Chairman of the Congressional Western Caucus, today announced that he recently obtained the preceding 14 pages previously missing from an internal Department of Interior (DOI) memo leaked last February. The original document obtained in February by Bishop detailed planning within the DOI to use the Antiquities Act to potentially designate up to 13 million acres throughout the West as new national monuments. The newly obtained 14 pages further detail plans within the Bureau of Land Management (BLM) to completely overhaul the way federal lands are managed in the U.S., including the creation of new ecosystem areas that require the acquisition of new federal lands. The plans would vastly expand the power, reach and control of federal land managers. Page 3, paragraph 6: The sentence, “In order to expand this network of treasured lands to include the diversity of landscapes currently managed by the BLM…,” shows that the Administration is working to broaden the jurisdictional scope of lands currently managed by the BLM. Page 5, paragraph 5: The sentence, “Should the legislative process not prove fruitful, or if a nationally significant natural or cultural land resource were to come under threat of imminent harm, the BLM would recommend that the Administration consider using the Antiquities Act…,” shows that the Administration is constructing a new management structure without the approval of Congress. Page 6 (b), page 7 (4. ), page 8 (3. ): Details planning for further land acquisition and funding mechanisms. Page 7, paragraph 1; Page 6, paragraph 7: By their own numbers, the Administration will target the “acute” problem of private landholdings in BLM administered areas to the sum of 412,675 acres, or more than 370,000 football fields. Page 9, paragraph 5: The sentence, “The BLM recommends that any major funding increases be phased in over a five-year period to allow the BLM time to build capacity in order to accomplish the increased work-load,” shows that the BLM will require an increase in funding to accommodate the proposed expanded management of lands throughout the West. The newly obtained 14 pages further detail plans within the Bureau of Land Management (BLM) to completely overhaul the way federal lands are managed in the U.S., including the creation of new ecosystem areas that require the acquisition of new federal lands. The plans would vastly expand the power, reach and control of federal land managers. Now, let’s understand just where the Hammond family of cattle ranchers fit in with all of this. They are the last private property holdouts in an area surrounded by BLM land. The court has declared that the BLM has first right of refusal to buy their land if/when they decide to sell. This is a polite way of stating that since the government is intent on grabbing the land for Agenda 21, everything will be done to get that accomplished. And when the Hammonds can no longer run their ranch due to unjust imprisonment, restriction to water and loss of grazing rights, no one will be able to buy it or even want to except for, you’ve got it, the BLM. And the agency will get it for pennies on the dollar. Leasing it for oil and gas interests. 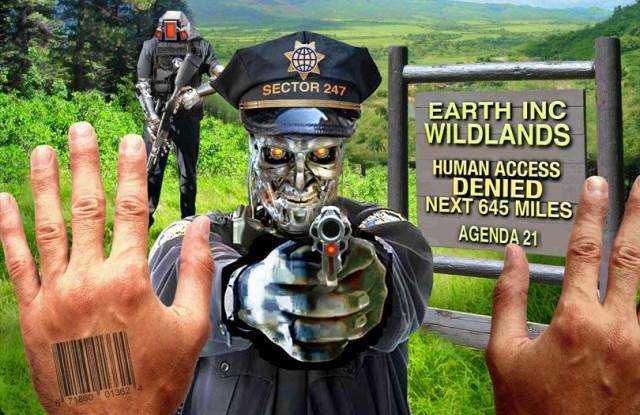 This entry was posted in Agenda 2030, Agenda 21, America, Waking Up and tagged Agenda 21, Barbara H. Peterson, BLM, Bundys, Farm Wars, Hammonds, LeVoy Finicum, Mining rights, Oil and gas leases, Oregon, uranium. Bookmark the permalink.